Contains milk. Manufactured in a facility that also produces soy products. Do not use diets supplying less than 400 calories per day without medical supervision. 100% grass fed whey. rBGH-Free whey from milk without artificial growth hormones. Antibiotic free. Contains no added sugar. Gluten free. GMO-free. Designer whey performance proteins (grass fed rBGH-free whey protein concentrate, grass fed rBGH-free whey protein isolate, l-glutamine, l-leucine, taurine, l-phenylalanine), non-gmo prebiotic vegetable fiber, natural flavors, electrolyte replenishment blend (calcium phosphate, magnesium oxide, sodium chloride), sunflower lecithin, monk fruit, dried cream extract, stevia leaf extract, zinc gluconate, Energy optimizer blend (calcium pantothenate, pyridoxine hydrochloride, thiamin mononitrate, riboflavin, digestive enzymes), Probiotics (lactobacillus acidophilus, B. Longum, L. Plantarum), vitamin E (as mixed tocopherols), Vitamin D3 (cholecalciferol). 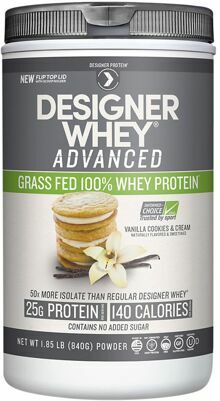 Grass Fed 100% Whey Protein! 25 Grams Of Protein Per Servings! Natural whey from year-round grass fed Wisconsin cows cared for with a diet free of artificial natural growth hormones and antibiotics. *The Prebiotic Fiber From Vegetables Contains 2 Calories/Gram Unlike Digestible Carbohydrates Which Contain 4 Calories/Gram.